My alarm was set for 4 am but thanks to my lack of sleep I just couldn't face getting up for sunrise, and I turned it off almost involuntarily, before quickly disappearing back into unconsciousness. Woke up again at 8 feeling slightly guilty for not making the most of day, but not too guilty, and made a quick escape back to Waterfall Country to do the Four Falls Walk I didn't have the time to do previously. There were already a handful of people about when I arrived at the Cwm Porth car park, it was a Saturday, so I wanted to get started before the crowds arrived. Shortly after setting off, I took a short detour down to where those who have a penchant for potholing can access one of the entrances to the River Mellte as it thunders through an underground passageway, to get a few pictures of a rather fetching woodland scene. I took the disorderly path as it meandered through the lush undergrowth, following the sound as it washed through the trees, to where the river exits the tunnel in a flurry of activity. I stood there for a while watching the water surge into the daylight, buffeting the rock walls around it, as it has done for thousands of years, wearing them as smooth as glass, before I headed back to the main path. Following the river, which by now was calm and wide, was pretty slow going as the pathway was all rocks and tree roots, so every step had to be judged and plotted. I stopped at a small clearing and waded into the shallows to get a shot of the waterway. Canopied by the light green of fresh leaves, it was a very peaceful spot to be, and I took a a few minutes to rest up and listen to the gurgling of water and chirping of the birds. After walking a bit further, I came across the pathway to the first fall, the mighty Sgwd Clun-Gwyn, a cascading monster that could be heard well before it was seen. The only shots to be had were from above, as there was no access to the valley below, unless you had arrived by river of course. Which seemed to have been the case for a group of outward bound types who were hurling themselves into the torrent, obviously under the strikingly misguided belief that it was an enjoyable thing to do. I watched them for a while, curious as to the point of it all, and wondering if this was some kind of energetic assisted suicide enterprise, but it was clear from the endless shrieking and bellowing that their numbers were not diminishing, so I carried on. At least they helped to add a sense of scale to the falls. I followed the path for some distance through open woodland until I spotted a shady patch of pine trees, where I took the opportunity to sit down for 10 minutes. The day was hotting up and as I had dressed for the cool morning, plus I was carrying around all my camera gear, meant a few minutes to cool off was very welcome. There were a smattering of bluebells about, and with the birds in full song I wasn't in a hurry to get going again. Next it was a trip down the steep path to Sgwd y Pannwr, or the 'fall of the woollen washer', it's name suggesting it was once used for washing wool, shorn from the local herds of sheep that used to graze in the area. 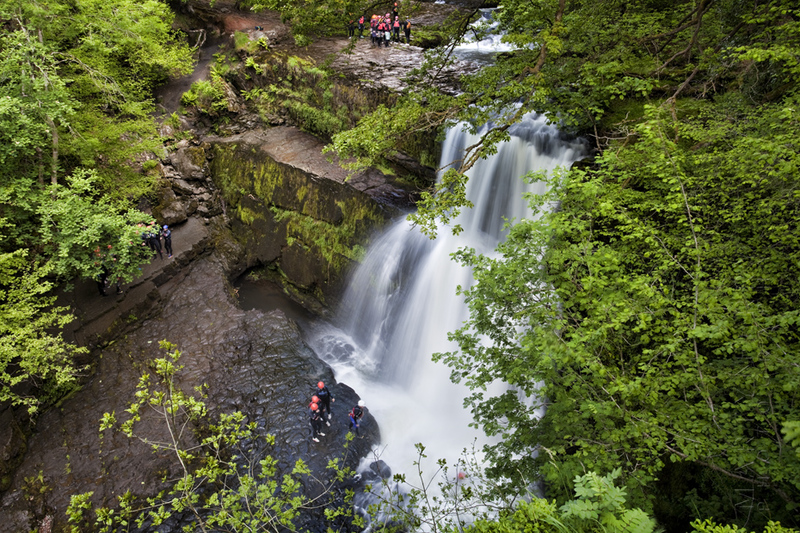 I managed to clamber down to a muddy ledge to get an uninterrupted view of the wide falls, as they stretched away from me, at least until another group of wetsuited lunatics turned up with the intention of flinging themselves at it. Not keen to have a parade of sales reps heaving themselves in my general direction on a manly mission to out do each other in the name of team building, I quietly packed up and headed off to Sgwd Isaf Clun-Gwyn. 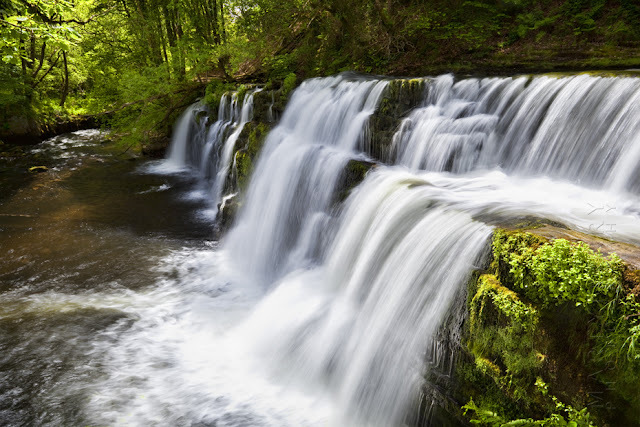 Reached via a very rough path, this picturesque series of cascades culminates in a wide thunderous fall. The noise of so much shifting water was outrageous, and it took a bit of getting used to after the quietness of the riverside route to reach it. I got a few shots looking onto the series of falls as they brought the tumbling water to lower ground. But it wasn't long before another suicidal group of maniacs trundled into view, desperate to chuck themselves into the swirling abyss. Continuing on my way over the precipitous, rooty landscape I found myself at the top of the falls, and I had it to myself, which was just as well, as there wasn't a lot of room to manoeuvre up there. I took some pictures before making the onerous journey back up to the main path. By the time I reached the top I was in need of another sit down, this time accompanied by a couple of biscuits, or lunch, as I hadn't thought to bring anything with me, and I happened to find them I my camera bag, probably placed there months before. The top most fall in the series, ample, rambunctious and very noisy. My last stop was Sgwd yr Eira, the only fall on the walk that lies on the River Hepste, again it was a steep walk down to the river bed, very steep in fact, but I was keen to visit this one as you could walk behind it, and walk behind it I did. And it was marvellous. Once I had taken a stroll behind the roaring curtain a couple of times, and got a few pictures of the falls I was ready to go. It was by far the busiest place I’d been all day and I wasn't desperate to stick around, so I was soon trekking up the, what seemed like, endless steps back to the path. I continued following the circular pathway, stopping along the way to photograph an indomitable old oak tree, which I couldn't resist getting a picture of, before taking a different route back to the car. It took me along small country lanes and past fields brimming with flowers, which looked lovely in the late afternoon sunshine. This old man stood out among the straight lines of pine trees. By the time I got back to the car park it was around five, and considering I had started the walk about nine, I considered that a good days work.